first time since the AKC® was established over 125 years ago that a special designation of breeders was to be recognized. 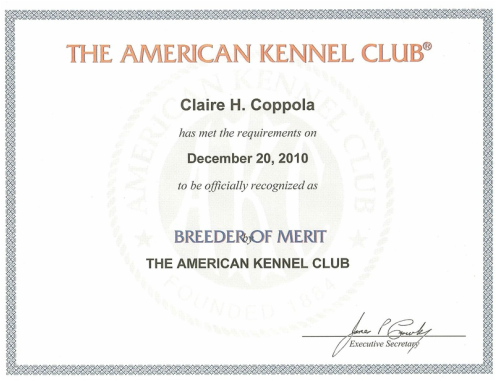 The purpose of the AKC Breeder of Merit Program is to identify and honor those breeders who consistently meet the high standards of the AKC and who actively promote the sport of purebred dogs. AKC Breeder of Merit Participants demonstrate a commitment to the AKC community, dedication to improving their breed, along with breeding dogs who are title winners.